I haven’t seen so much despair in my country in a long time — not since the murderous dictator, Sani Abacha, was military head of state in the mid-1990s. The return of democracy to Nigeria coincided with my coming of age. I was 14 when Nigeria finally had its first successful elections in nearly two decades, and I remember how dark the future looked to almost everyone before then. And I remember the hope that coursed through the citizenry like electricity when the tentative steps toward restoring democracy proved successful. Nigeria’s democracy has not been perfect. The economy has not fulfilled all of its promises. Corruption continues to define daily life, and a life-sucking elite continues to collude to keep a dysfunctional system running for its benefit. But over those many cycles since 1999, we have moved resolutely forward in many ways — from fighting polio and HIV, growing our GDP, moving to free and fair elections, and setting up judicial independence (though this last bit is now under assault). THIS SATURDAY WE NEED TO REMEMBER THAT AT LEAST WE HAVE A CHOICE. And most importantly, our elections have always given us hope. When a former president allegedly wanted a constitutional amendment to get him a third term in office, the legislature beat it back in a sign of our democracy’s virility. When a powerful cabal tried to keep a medically brain-dead president in office, citizens hit the streets and shut it down. In 2011 we got the first ethnic minority president, and in 2015 we elected an opposition party into the presidency — another first in our nation’s 55-year history. You could feel the excitement during these elections. Citizens were thrilled about the possibility of change, the intensity of hope, the abundance of inspiration. 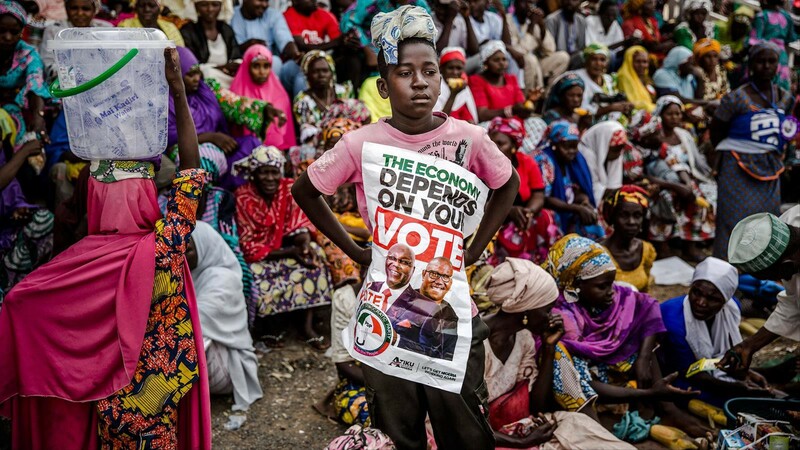 Nigeria goes to vote again this weekend, and all you see, read and hear around you is despair. It calls to mind the lack of excitement witnessed during the Clinton–Trump contest in 2016. Nigeria, whose electorate heads to the ballot box tomorrow, has its own version of this with historically unpopular candidates. On the one hand, there is the uninspiring President Muhammadu Buhari. In 2015, Buhari represented a nation’s aspiration — the possibility of unseating a 16-year ruling party. Nigeria had never seen anything like it. It was a historic validation of people power. But after four years in office, he has not only lost that shine, but he has also lost moral authority — owing to a cascade of bad decisions, bigoted statements and sheer ineptitude. On the other hand, there is former vice president Atiku Abubakar. Not only does he come with the stench of (alleged) personal corruption, including a decade-long ban from entering the United States, but he has only recently been caught on tape literally promising to enrich his friends when he gets into office. The hope, often expressed online and offline by citizens, for a third-force candidate drawn from a coalition of third-party hopefuls has dwindled after a series of unsuccessful negotiations, leaving the country to face the worst possible alternatives: voting with our hands holding our noses. Still, electoral democracy is the way that we have carefully, deliberately chosen. It’s a long-term process, its muscle built electoral term by electoral term, and so this Saturday we need to remember that at least we have a choice. We will show up, we will do our parts even if we do it without excitement, and we will send a message loud and clear about our commitment to making this process work, no matter how long it is going to take. Hope is inexhaustible. Hope will be the gift we give ourselves.